Top 8 Movies for Galentine's Day | Grand Central Magazine | Your Campus. Your Story. If you’re planning on staying in and hanging out with your gal pals Feb. 14, this post is for you. From heartfelt love stories to comedies, here are eight movies to watch with your girlfriends this Galentine’s Day. This is the story of Kate, played by Tina Fey, a businesswoman who decides to enlist Angie, played by Amy Poehler, to be her surrogate. When Angie pops up at Kate’s house homeless and broke, Kate takes her in and attempts to help Angie get ready for their big day, and hilarious hijinks follow. It wouldn’t be Galentine’s Day without some laughter, and this movie brings a lot of it. “Hello, my name is Inigo Montoya. You killed my father. Prepare to die.” A comedy and classic love story, this movie is sure to warm your heart and make you laugh your “forever alone” blues away. “The Princess Bride” tells the love story of Wesley, played by Cary Elwes, and Princess Buttercup, played by Robin Wright. The lovers must find their way back together while fighting time and Prince Humperdink’s mission to become king. If the name “Humperdink” doesn’t get you laughing right away, the sarcastic remarks and sometimes cheesy scenes will. For those of us who absolutely love Julie Andrews and this movie as a kid, “The Princess Diaries” is a necessity for Galentine’s Day. This story follows high schooler Mia Thermopolis, played by Anne Hathaway. Mia finds out that her grandmother, played by Julie Andrews, is royalty, and that she is and has always been, a princess. Mia must go through the struggles of balancing normal and royal life. This movie is hilarious, loveable and relatable; who wouldn’t want Julie Andrews to be their grandmother? The story of best friends Romy and Michele, played by Mira Sorvino and Lisa Kudrow respectively. Romy and Michele come up with a plan to make their lives sound sensational when they couldn’t be anything further from the truth, to stand up to their old classmates at their high school reunion. Things can’t help but get out of hand. This comedy and friendship makes this movie a roller coaster ride worth watching! Katherine Heigl from “Grey’s Anatomy” plays Jane, a woman who’s the definition of the phrase, “always a bridesmaid, never the bride,” having been one for, you guessed it, 27 weddings. Jane has a huge crush on her boss George; little does she know that introducing George and her younger sister Tess will lead to the two getting engaged. James Marsden stars as Kevin, a cynical wedding writer looking for a way to move up at his newspaper. While writing about her sister’s wedding, Kevin finds out Jane has been a bridesmaid 27 times and immediately smells a story. He begins vying for Jane’s attention to get the scoop…and falls in love with her in the process. If you love a good love-triangle, this movie is for you. “Bridesmaids” follows the story of Annie, played by Kristen Wiig, who is broke and single. She becomes the maid of honor for her best friend Lillian, played by Maya Rudolph, and Annie’s duties as the maid of honor start to backfire. “Bridesmaids” is uniquely charming. There are relatable moments, scenes that may be gross and scenes that are real tear-jerkers. Overall the film is a heart-warming story, and is a testament to friendship and being there when your friends need you the most. In other words, it’s a great Galentine’s Day movie. If you’re looking for a feel-good romantic comedy filled with iconic actors and actresses, look no further than”Valentine’s Day.” The movie follows a multitude of people and their comedic journeys on Valentine’s Day. You definitely won’t get bored with so many storylines to follow, and there may find some hilarious surprises along the way. 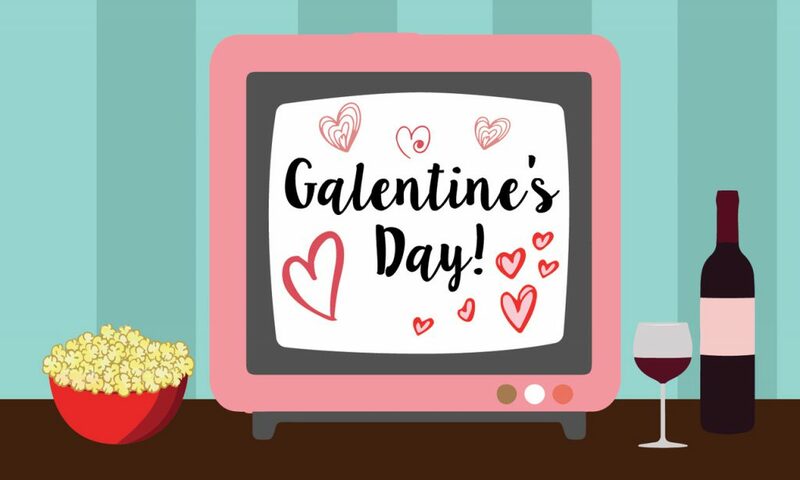 Time to kick back, relax, and enjoy a few movies with your friends this Galentine’s Day! Which one is your favorite? Let us know! Separator image Posted in Arts & Entertainment, Movies, Movies, Pop Culture and tagged with Arts & Entertainment, Galentine's Day, Katie Sergent, Movies, Pop Culture.